Obama: Rumors Of My Demise Are Exaggerated : The Two-Way At a White House news conference, the president was asked about Syria, the Boston Marathon bombings, new gun laws, the Guantanamo Bay detention center and other subjects. He made the case that despite some setbacks, he'll still get some important things done in his second term. "Rumors of my demise may be a little exaggerated," the president said, as he predicted that an overhaul of the nation's immigration laws will be among the things that get accomplished in his second term. 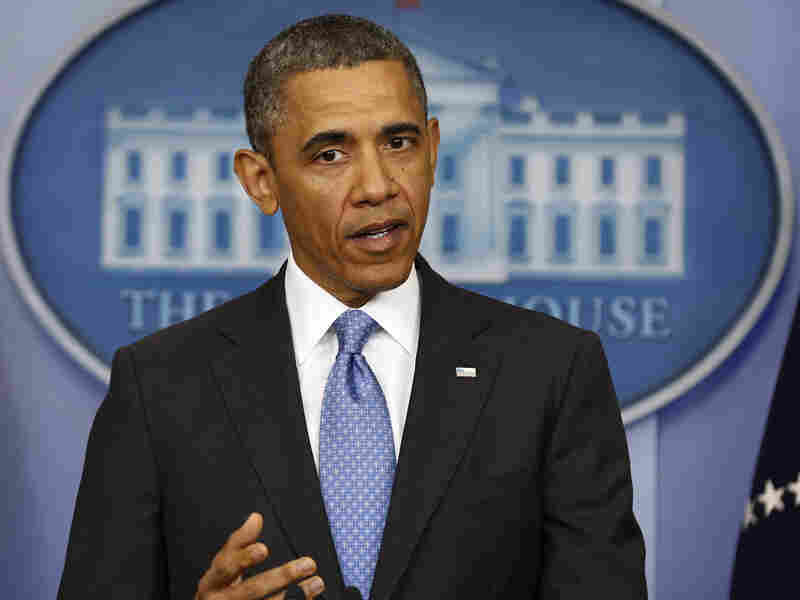 President Obama during his news conference Tuesday at the White House. -- He is impressed by the immigration legislation drafted by the bipartisan "Gang of 8" senators. -- It's still his view that the facility in Guantanamo Bay needs to be closed. -- More evidence is needed to confirm that the Syrian government used chemical weapons on its own people. If it is proved that the Assad regime did that, "we would have to rethink the range of options that are available to us," Obama said. -- The director of national intelligence is reviewing how intelligence about the suspects in the Boston bombings was handled in the past few years. The president called such a review "standard procedure." As he wraps up the news conference and steps away from the podium, Obama is asked for his reaction to the announcement Monday from National Basketball Association player Jason Collins, who became the first active player in the four major American team sports to come out as gay. Obama says he has spoken to Collins, and "I told him I couldn't be prouder of him. ... The LGBT community deserves full equality, not just partial equality." It's "not the bill I would have written ... but it meets the basic criteria that I laid out from the start," Obama says of immigration legislation drafted by the bipartisan "Gang of 8" senators. He believes the bill aims to make border security more effective, the current legal immigration system more efficient and that it would crack down on employers who are "gaming the system." Those who suggest that the "Obamacare" rules left to be implemented will cause havoc don't understand, Obama says, that most of the changes required by that law have already gone into effect. What remains to be done, he says, is setting up pool for those who don't have insurance now or pay exorbitant fees for coverage, "so that they can all pool together and get a better deal from insurance companies. ... That's it. ... That's all that's left to implement." "It is not a surprise to me that we've got problems at Guantanamo," Obama says after being asked why some prisoners at the detention center are on hunger strikes and seem to prefer death to being held there. Recalling that he said during the 2008 campaign that he would close the detention center, the president says, "I continue to believe that we've got to close Guantanamo. ... It is critical for us to understand that Guantanamo is not necessary to keep America safe" and that most prisoners can be tried in the U.S. instead. "I don't want these individuals to die," the president says of the detainees who are on hunger strikes. As for closing the detention center, which Congress has not allowed to happen, Obama says "I'm going to go back at this." "Do you still have the juice?" to get what you want done in Washington, particularly new gun laws, the president is asked. Put that way, he jokes, "maybe I should just pack up and go home." But, paraphrasing Mark Twain, Obama says that "rumors of my demise may be a little exaggerated." One piece of "historic" legislation he expects to land on his desk: an overhaul of the nation's immigration laws. After running through the problems he sees with the so-called sequester and its automatic budget cuts, Obama says it's not his job to get members of Congress to behave. "That's their job," he says. Asked about a Boston Globe report that the director of national intelligence has requested a broad review into "the U.S. government's handling of intelligence information leading up to the Boston Marathon bombings," Obama says it is "standard procedure. ... When an event like this happens, we want to go back an review every step that was taken." The president also praises the efforts of state, local and federal officials to identify the suspects in the bombings, and says Russian officials have been "very cooperative" in providing information about those suspects and their possible ties to Islamist extremists. "What we have now is evidence that chemical weapons have been used" in Syria, the president says. He adds that it isn't yet known "how they were used, when they were used [or] who used them." So, while he has said the Assad regime would be crossing "a red line" if it used such weapons — and that their use would be a "game changer" — Obama says that "I've got to make sure I've got the facts" before taking action. If it is proved that the Assad regime used chemical weapons against its own people, "we would have to rethink the range of options that are available to us," Obama says. The president just came to the podium, saying he's just there to answer questions. So, no announcement from him. On the air, NPR Senior Washington Editor Ron Elving just said delays in getting news conferences started tend to build expectations because it's thought that the White House might be putting the finishing touches on an announcement. What might it be this time? Perhaps it's something related to deficit negotiations with Republicans. As we said earlier, these news conferences often do not start on time. That's happened once again. There's word from the White House that President Obama will be holding a news conference there this morning. It's set to start at 10:30 a.m. ET (though these events often do not begin on time; and this one's already been pushed back from its "original" start time of 10:15 a.m.). We will live blog during it. Earlier, the White House said there would be a "significant employment announcement for veterans and military spouses." So that may be the subject the president addresses in his opening remarks.